Today we have the superhero show on Netflix that most of you probably didn't watch. I have a soft spot for both The Wachowskis, and J. Michael Straczynski, so when the two teamed up with Netflix for Sense8 I was excited. 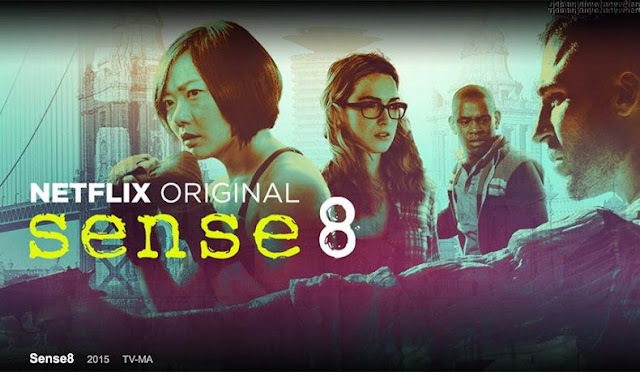 The basic concept is that eight strangers scattered around the world suddenly develop and share a supernatural link that allows them to communicate with each, and even share each others skills. There is of course a conspiracy at play, but the majority of the first season served more as origin stories for each of the eight central characters. With a truly diverse cast that spans Korea, Africa, India, Europe, Mexico, and the US, we get some of the most original feeling characters in quite a while, simply because we aren't use to stories that aren't rooted firmly in the American experience. It was slow, thoughtful, long form storytelling, that apparently wasn't to everyone's tastes. That said, Netflix have renewed the show for a second season, and I'm looking forward to finding out more about the wider story that they have in mind. To me, it's what I always wanted Heroes to be, but never was, because they never had confidence in either their characters or long arcs. Here the cast are front and center, and as we share in their voyage of discovery, I can't wait to see what happens when they start to master them.